With over 30 years of experience in custom picture framing Watergate Gallery & Frame Design is able to offer expert service for all framing needs. 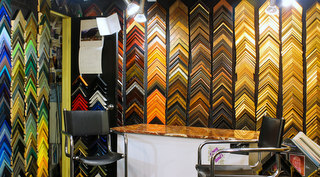 We offer distinctive custom framing in modern and traditional styles. There are over 2500 frames to choose from and we take pride in offering quality materials to ensure all framing is done with preservation standards. The use of acid free matting materials and conservation or museum glass or UV plexiglass to protect art works and objects from ultraviolet rays is encouraged. We have a lot of experience in framing all types of artwork from canvas to paper, photographs, fabric and needlework, objects including baseball mitts, boxing gloves, revolvers, swords, and medals. With a wide variety of materials available we are able to help design framing that is creative but still has a timeless quality so it will be pleasing for a long time. All work is done on the premises. Rush service is available on request. Watergate Gallery & Frame Design also offers limited service for restoration of picture frames and artwork. We recommend a check up on valuable pieces of art to ensure that they have been framed properly with acid free material and conservation glazing in order to maintain their integrity and value.